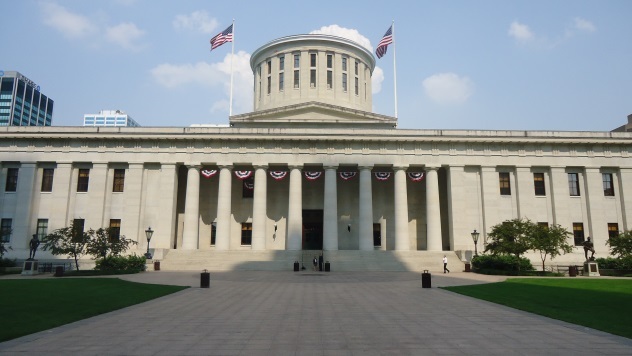 Recently, the Ohio House of Representatives approved a drastically different two-year state budget from the one proposed by Governor John Kasich in January. The House budget included roughly $632 million in reductions due to decreased state revenue collections, and so far for the fiscal year FY2016-17, receipts are $773.7 million, or 4.2 percent, below projections. This followed an announcement in April by state leaders that the budget would need to be revised downward by roughly $800 million for the next biennium (FY2018-19). With passage of the House version, the budget now moves to the Ohio Senate, where additional reductions will be needed to meet the $800 million in cuts. The deadline to approve the budget is June 30, when the current state fiscal year (FY2017) ends. Greater Ohio Policy Center (GOPC) continues to testify on several changes to be made in HB49, including the following provisions. - The budget bill provides $4.8 million in annual funding over the biennium for lead remediation and associated testing services for homes under lead hazard orders, ensuring that more properties are made safe for families. This will be done through the use of federal funding available to the state. GOPC is pleased by the state’s commitment on this important issue and encourages the Legislature to ensure local lead abatement programs are empowered to utilize the funding. - A House amendment would mandate stickers be affixed to retail service station pumps displaying the rates of federal and state taxes applicable to gasoline and diesel fuel. The stickers would be produced and distributed by the Department of Agriculture at an unknown cost. All pumps would be required to have the stickers affixed within 14 months of the bills effective date and would need to be replaced if damaged or if the state or federal tax rates change. - The House reduced funding for public transportation by more than 11% per year for both FY2018 and 2019. This line item provides funding for the Public Transportation Grant Program and the Elderly and Disabled Fare Assistance Program. This line item has been reduced by more than 68% or $17,969,134, since FY2000. - GOPC proposes an amendment to make it easier for cities to clean up contaminated brownfield sites. The proposal would modify Ohio law to make it clear that urban renewal projects can recover the costs of environmental remediation. In an urban renewal project, a municipality and a developer create a development agreement to mitigate a blighted area. After development begins, the property owner makes service payments in lieu of taxes, based on the increased valuation of the property. Service payments support bonds that have been issued to support redevelopment costs. - The federal Center for Medicare and Medicaid Services has issued a directive that Ohio cannot continue applying state and local sales taxes on the premiums of Medicaid Managed Care Organizations. HB49 provides for a new service fee to be charged to make-up for lost state revenue, while only providing partial, temporary financial relief to counties and transit agencies. GOPC supports the inclusion of a provision in HB49 that will extend greater financial relief to counties and transit agencies. For more complete coverage of the Main Operating Budget, please visit here.